Are you looking for professional cleaners in East London? Do you have problems with regards to cleaning your home? Do you feel so tired after a long day at work that you can’t even pick up a single piece of crumpled paper? Are you desperate to make your house look cleaner? Well, if that’s the case, then you need to make a wise choice and look for a dependable and trustworthy cleaning company that will gladly take care of all your cleaning problems. Our teams are capable of delivering quality services at very affordable and reasonable prices. We also offer big discounts and free quote. We are well known by the public due to our fast response and delivery of services. These services are carried out responsibly by our competent recommended cleaners and we assure you that they are insured, honest and reliable. They have undergone different trainings and they are capable of giving you excellent services at a very short span of time. 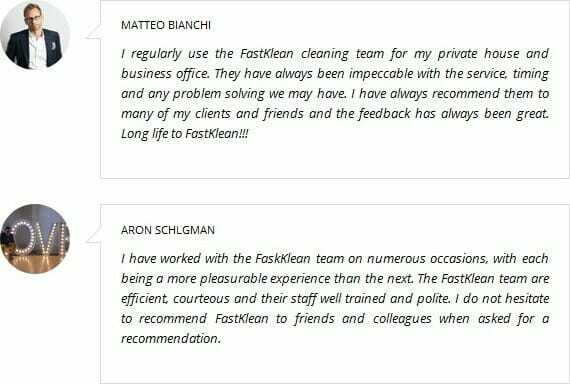 Unlike some cleaning companies, FastKlean uses products that are environment friendly and also safe on your carpets and even walls. Our cleaning products are not just every day domestic, supermarket items but are solutions which are exclusively made by us and are considered effective but do not pose any danger to your pet and family. These solutions are biodegradable and are carefully kept in our storage areas. E1, E2, E3, E4, E5, E6, E7, E8, E9, E10, E11, E12, E13, E14, E15, E16, E17, E18. If you happen to have any questions and need any further information about our professional cleaners in East London, call us on 020 8884 9149 and we will immediately respond to your call.